Get your Product Data Feeds in Shape. 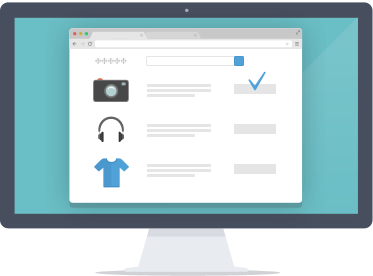 We help online shops manage and optimise their product data feeds performance in real-time. Managing Data Feeds for you across number of shopping platforms. Google PLA management, monitoring and performance optimisation. Master Product Feed Creation and Website data scraping. Get your data feeds in shape. Feed Optimise makes sure that your feed is up-to-date, contains all informations and best selling products. Our system will constantly keep an eye on your products performance making sure to maintain their Cost of Sale within levels defined by you. You can call us at any time, we will assist with any questions or setup and we'll fully manage your data feed across all channels you will be listed on. Monitor how your feeds perform across any marketing channels, what products visitors buy and which channel monetise the best. We work with price comparison and affiliate networks located in any country thus providing our service to the customers around the world. We're 100% compatible with any shopping cart: commercial, open source or custom-made. Our system supports any shopping or affiliate channel. Grew our traffic and saves us money. ...Great analytics, quick response and great service - it is a pleasure to deal with this company. Dont waste your money with any other provider as the platform and service will not be as good as Feedoptimise. The service is directly conducive to effectively managing a wide range of marketplace platforms. Dont put your trust in your e-commerce system, instead use these guys, cannot speak more highly of them. We recommend Feedoptimize to our professional and personal network and highly recommend their team, unreservedly. Not only would I recommend feedoptimise to other retailers (of any szie) I would suggest it be mandatory! ... have found Feedoptimise to provide the best combination of features... Try it before the others.